Camping is a popular activity on Kauai and this is not surprising considering the island's spectacular beaches, rainforests, mountains and breathtaking vistas. There are 13 campgrounds on Kauai, ranging from beach campsites to mountain cabins. Six of them are state campsites and the remaining seven are county campsites. If you plan to camp on Kauai, no matter if at a state or county site, you will need to obtain a camping permit in advance. 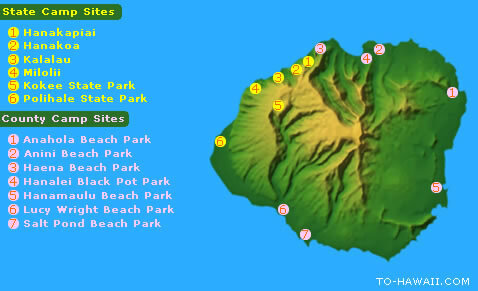 All state camping areas are administered by the Hawaii DLNR, State Parks. They prefer that all reservations are made on their online portal, which is located at: www.hawaiistateparks.org/camping/kauai.cfm (see the button “Online Reservations” in the top left corner on their website). You can make your reservation up to one year in advance. Hawaii residents: $12 per campsite per night for up to 6 persons; $2 per night for each additional person*. Maximum fee per site: $20/night. Non-residents: $18 per campsite per night for up to 6 persons; $3 per night for each additional person*. Maximum fee per site: $30/night. *Children 2 and under free. Hawaii Residents: $15 per person per night. Non-residents: $20 per person per night. It is a good idea to make your reservation well in advance, at least a few months, because space is limited. If you plan to hike the Na Pali Coast and would like to camp there, make your reservation at least six months in advance. Camping permits for the Na Pali Coast are very much in demand. County camping permit fees are $3 per adult per night for non-residents and free for Hawaii residents (Hawaii ID required). Children under the age of 18 years are also free and must camp with at least one adult 18 years of age or older. For more information about county camping permits, call the County of Kauai, Department of Parks & Recreation, Parks Permit Section at (808) 241-4463.